Paradise Tower Hire services the EWP needs of the region’s local councils, private construction, retail and tourism sectors and much more. Gannon adds, “Paradise Tower Hire would be one of the Gold Coast’s biggest independently owned and operated family access hire firms, and we’re delighted we’ve been able to help Jim grow over the last 20 years.” Apart from Manthey, his son Brodie, daughter Melissa and future-wife Jenny Rendell are also members of the Paradise Tower Hire team. 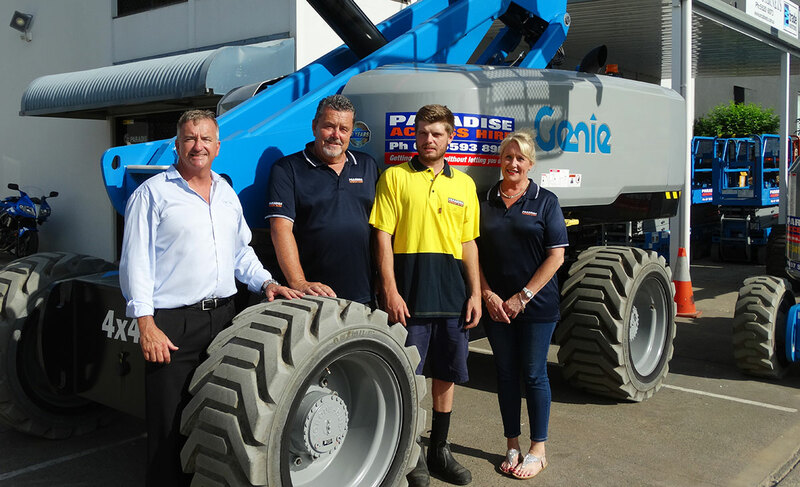 In recent times, Paradise Tower Hire has beefed up it’s predominantly Genie® fleet with some Genie Z-34/22 N electric articulated boom lifts, and several Genie Z-51/30J RT boom lifts. More recently a Genie 85 ft telescopic boom has been added to the fleet along with the new Genie Z-62/40 booms, the compact and hardworking knuckle boom offering outstanding vertical and horizontal reach, manoeuvrability, working envelope and servicing. Manthey says, “Every year we seem to buy several machines. I love Genie big booms because they give our customers extra versatility to get to places our truck, with outriggers, can’t get to. Bigger machines give us more significant returns. “The Genie 85 ft telescopic boom are a favourite of painters working in the many resorts dotted along the Gold Coast” he adds. As for his fondness for maintaining a mostly blue fleet, Manthey compares his Genie affinity to a Holden motor car enthusiast. “I see Genie as the Holden of the EWP sector. I like to stick with the one brand, and I love their aftersale service levels and the reliability of their machines, which in combination give us a good return on investment. “Genie is always there when you need them, and I’d like to give credit to their service technicians. They always do the right thing and are there to help us,” confirms Jenny Rendell, who doubles as the office manager at Paradise Tower Hire.